When Price and I first met ages ago he did not like seafood. At all. Well, with the exception of the fried fish dinner from Doug’s Fish Fry from back home. And I think that was only because they have the best cole slaw there. Over the years he has been more adventitious and has expanded his pallet so every now and then we had seafood for dinner. 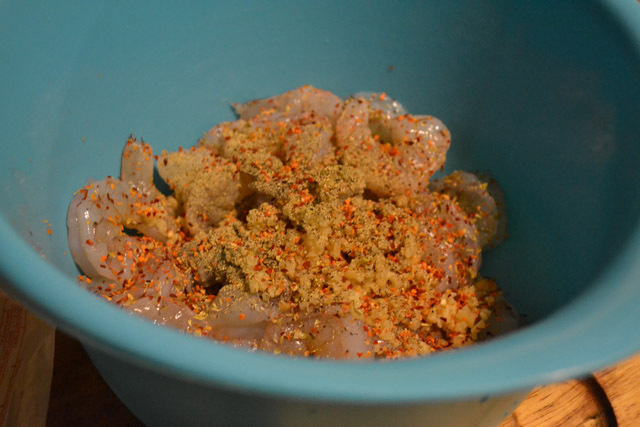 Shrimp was on sale one day so whipped up this super simple, flavorful dinner for us on a whim. This was so easy to prepare. The prep time was so fast as most of the work was done for me has the shrimp had been de-veined and de-shelled. I only needed to remove the tails before tossing together the rest of the mixture. This could be served with rice or pasta but I decided to not dirty another pot and just enjoy it with french bread. Normally, I would drizzle the bread with extra virgin olive oil but the rest of the dish was so indulgent with butter, oil, and wine so I keep it basic. Besides, the bread would just be dipped into the ‘broth’ anyway. This is very garlicky so this is not a first date kind of meal, enjoy it with someone you love and some wine! Preheat oven to 425. Line a large rimmed baking sheet with aluminum foil. 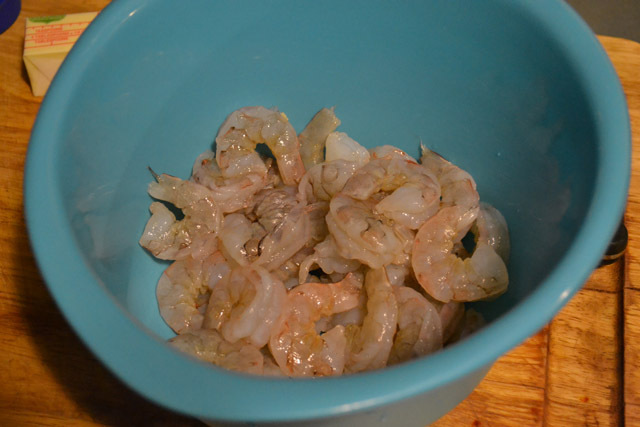 Rinse and remove the shell and tails from the shrimp. 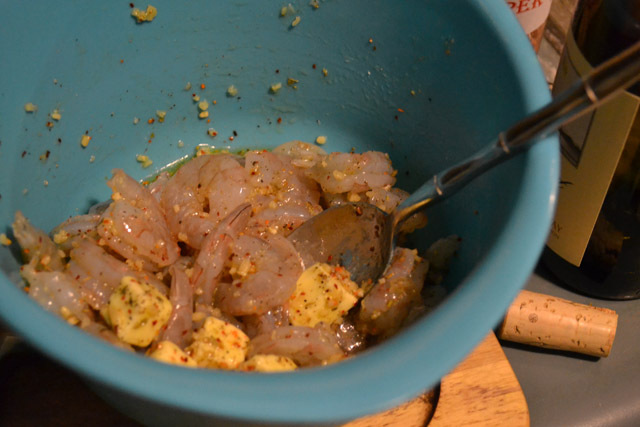 In a bowl, mix together the shrimp, garlic, butter, olive oil, wine, oregano, red pepper flake, and the juice of 1 lemon. Sprinkle with salt and pepper. 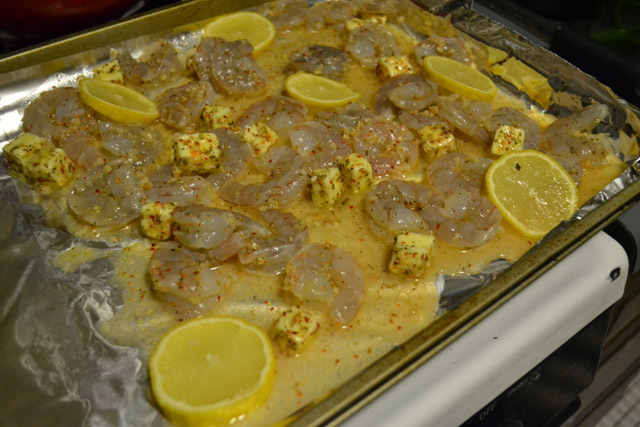 Lay out the shrimp mixture on half of the lined baking sheet. 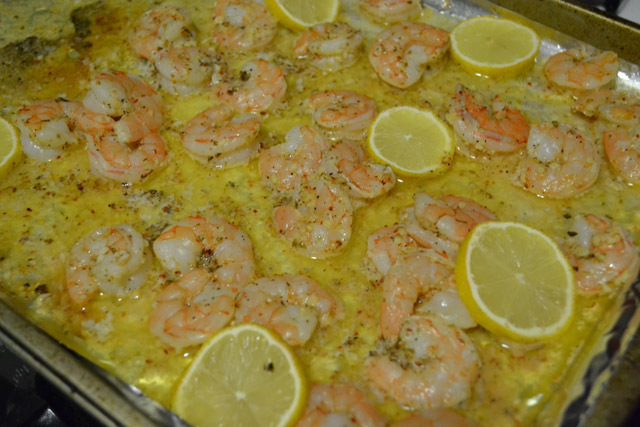 Cut the remaining 1/2 lemon into thin slices and lay onto the shrimp. Slice the french bread into 1/2 thick pieces and lay out on the other half of the baking sheet. 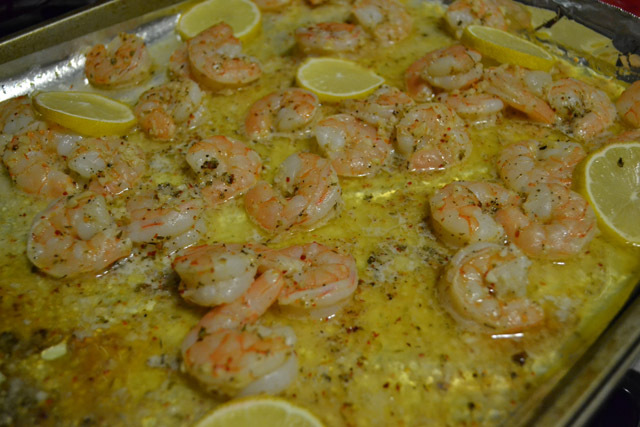 Bake for 12-15 minutes, it is done when the shrimp have all turned pink. 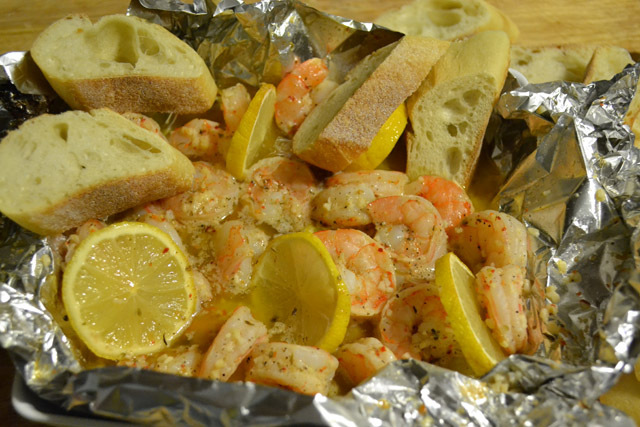 First remove the toasted bread, then carefully pick up the aluminium foil to transfer the shrimp and it’s cooking liquid to a serving dish.